“If I can just reach Melendrez Pass”, mumbled Kelsey as she quietly shuffled her trail shoes along the dusty dirt path, high in the Santa Rita Mountains. At 5,784 feet the pass is not a high one, but one that she had worked hard to attain. While dimly realizing she still had about nine miles of rough, desert terrain to battle. Unfortunately, her battle was much deeper, more personal than those limited miles depicted on her ruffled race map. At the age of three, Kelsey had been living the normal life of a child growing up in Helena, Montana. Some tantrums, swirled in with laughter, pulling the cat’s tail and a quizzical nature that made Kelsey a walking textbook of childhood life. Then life took a turn, that caught the Jackson family off guard and Kelsey had been losing weight, drinking extreme amounts of water and had a bewildering lack of energy. Life should not be sucked out of someone so young and usually vibrant. Her body was doing the only thing it could do in this extreme situation. Flush out the extra sugar as she now had type 1 diabetes and her pancreas was no longer making insulin, a hormone that helps the glucose in your blood get into your cells to be used for energy. Kelsey looks back. No one is in sight. She has been running on her own for the last couple of hours. The start gun went off promptly at 6 am and she was joined by Brad as #105 and #134 rambled forward in the dark as the Old Pueblo Endurance Run adventure left historic Kentucky Camp as the headlights bobbed and the footsteps headed north, on a chilly Arizona morning. Brad, ever complaining about sore knees, had dropped out at the Gardner Canyon Aid Station suggesting that he would rather be at home, eating pizza than enduring a ‘sufferfest’ that he actually had paid to be a part of. Kelsey had trained and felt ready for the event but there would be a few question marks as the race drew near. “You Go Girl!” yelled Brad as he stepped into the aid station. An untied shoe and an open trail running pack, with a few items that had found a new home along the course, seemed to sum up Brad’s mentality. 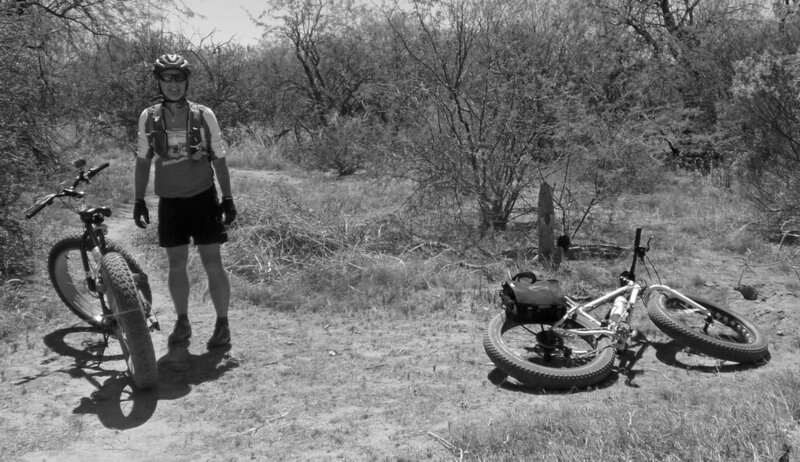 On to conquer pizza while the K machine said a quick goodbye and strode toward the next aid station at Cave Creek and the brief thought of whether she had enough food in her pack to cover her for the coming stretch of climbs and distant aid stations. She quickly did a swipe on the last section of the table and grabbed two more Hammer Nutrition gel packs. This was a challenging race as Kelsey and Brad had contemplated their options for races in the Southwest for the coming season. Due to extreme temperatures during the summertime, this race had an early March date. Runners would encounter the mid 70’s which for many stumbling out of the frozen north would feel severe. Kelsey had been successful with 50k races and leaned toward an event that would further challenge her and maybe give her success that she initially felt she could never achieve while having diabetes. She had been a good steward with the diagnosis and had taken care of herself as well as possible and she was enjoying better blood sugar control with an insulin pump and a cgms (continuous glucose monitor system). A cgms is an advanced way for people with diabetes to check blood glucose readings in real time or monitor glucose readings over a period of time. The combination of these two made exercising and endurance events easier to control. In most people with type 1 diabetes, the body’s immune system, which normally fights infection, attacks and destroys the cells in the pancreas that make insulin. As a result, your pancreas stops making insulin. Without insulin, glucose can’t get into your cells and your blood glucose rises above normal. People with type 1 diabetes need to take insulin every day to stay alive. Besides some extra sugar in her system, Kelsey also has a dose of grit coursing through that 5-foot 6-inch frame. She knew that that would be her insurance ticket if she needed to cash it in. Now, where was Melendrez Pass? People with type 1 diabetes are more likely to get heart disease, stroke, kidney failure, high blood pressure, blindness, nerve damage, and gum disease. Untreated type 1 diabetes can cause coma. It can even kill you. While annoying, the ‘beep, beep, beep’ coming from her insulin pump was meant to relay important notices from the mechanical wizard that relied so heavily upon. It could be a warning that her sugar was getting low, the battery needed changing, she was almost out of insulin, or that the cgms sensor needed to be changed. The beep continued while Kelsey juggled the pump, while she ran, to see what the message was. She had an unsettled feeling, deep inside, of what this particular sound might signify. ‘Sensor Expired’ is what the screen indicated. With the rush of packing necessary food, supplies, gear bags for two aid stations, and a monumentally bad night of sleep, the all-important status of the cgms had not been checked on. Now she would rely on old fashioned blood sugar checks with a glucose meter. She shuffled through her bag for the meter. And shuffled some more. No meter. She yelled in anger and frustration. Her words tumbled down the mountainside. Kelsey had been consumed by too much at the same time and was could not remember what her last blood sugar was. She was tired, now stressed, alone, and still a distance from the finish. She began to panic. Nearly forty miles into a difficult trail race, she had expected to be extremely tired and there might be some ups and downs in her blood sugar, which would likely affect her energy level. The fatigue had a grip on her and it was now seizing her thought process. Were her blood sugar ok? She continued labored motion forward, ever so slowly. Unfortunately, the next aid station was unmanned, but she had faith that there would be a good selection of gels, treats, bananas and maybe even some solid, healthy food if someone had bothered to load it into a 4 wheel drive for delivery. Kelsey now lacked awareness of what was around her and the beauty that was around her went by, even more slowly, as her loping run became a staggered walk. After some effort, she ripped the running pack off of her back as it fell to the ground. For a moment she stood still, not knowing what to do. Her brain needed glucose to operate and it was functioning on fumes. She had made the difficult task to deal with the pack in search of some carbohydrates in case that she had low blood sugar. She was not sure of what she needed, but it was better to eat and be wrong than to not eat at all. She knew what the consequences can be of not taking care of a low blood sugar. The sad reality is that she had easy access to the glucose packets in the front of her pack. Her mind was now on hold. Now stretched across the dirt road she collapsed and had the pack behind her and now useless as her mind lost connection with the rest of her body. She was now in a coma and would rely on her grit and a helicopter flight to see her back at the starting line of the Old Pueblo Endurance Run the next year. On my evening run through the Arizona desert last night I had a number of wildlife encounters. Expected during the summer season and remarkably common during my runs on my local trail route. I would encounter two Western Diamondback Rattlesnakes this evening which gives me almost as many sightings as all of last year (a record year for me). It is still June with about four months of watching where I step and hearing the occasional rattle, jingling while I sort out how close I am to the snake. Of the many assorted and interesting critters I experience while I take in the desert environment, the most often seen, in this order are deer, rabbits and you guessed it, rattlesnakes. Twenty one at last count for the Spring and Early Summer season. Getting rather close to the number that welcomed me on my runs last year. I love wildlife encounters and, well, snake encounters are a not quite a love affair but I do take on a trail runner crazy enough to run through the desert in the summer time, will trek through snake territory and will have a few meet and greet sessions with other inhabitants toting a rattle. It is their home and I do respect that simple fact. Do rattlesnake's give my heart a jolt? No, but there is a bump in the heart rate when I take a quick dodge to the left or right to avoid a snake. They can blend in very well to the desert floor but I have had to become great with those scaly senses. 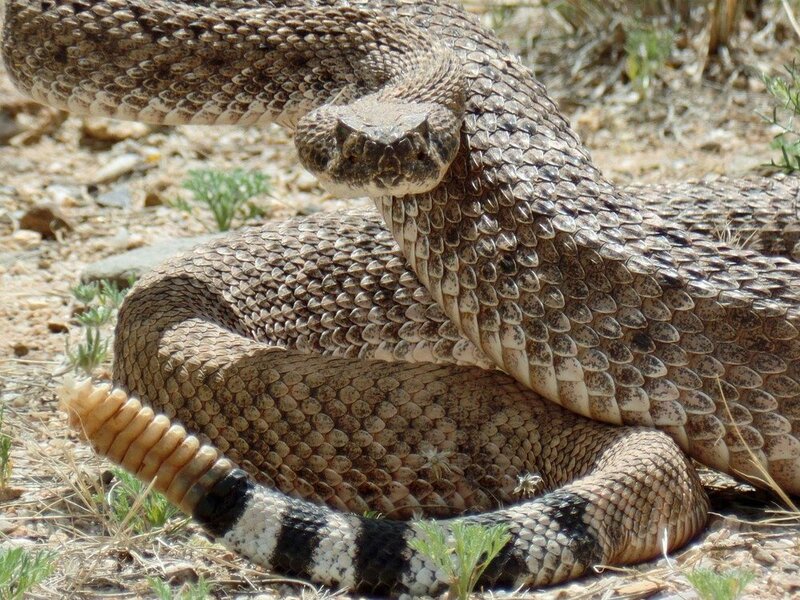 Very, very thankful that of all the creatures on the planet, the rattlesnake rates high on the list of animals that let you know of its presence. A beautiful fact and one of the reasons I have an admiration for the scaly and sometimes noisy, scary creatures of horror films and jolting newspaper articles. Oh, those stories of people who get bitten after decapitating a rattlesnake are primal fear unleashed. I have adjusted my trail runs, slightly, due to encounters at the start of my trail. There are one of two 'friendly' slithery reptiles along the start of my trail time. Roughly eight or nine meet & greets within the first minute of the trail. I had to wonder about the fact that there was a r snake 20 feet up the trail. 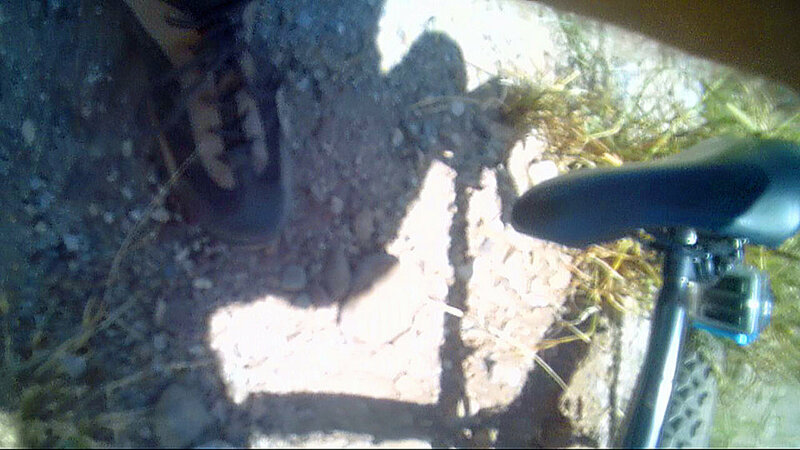 The photo below is another run-in that is at the exact start of the trail. Sheeesh! I now walk this lively section. Clock is ticking toward my next run. Almost all of the wildlife I see on my runs is during the suppertime excursion. I will have my eyes dialed in for any and all wildlife, capture what I can with my camera and enjoy getting out in nature and continue to improve my health and diabetes care. And watch my step. If you find yourself trekking through rattlesnake territory, do be ultra careful. 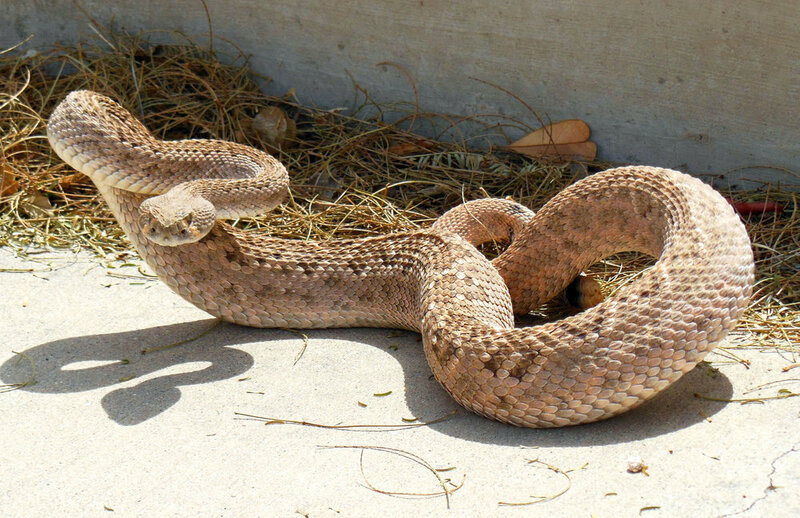 I have read about some horrendous encounters with some devastating results after interactions with Mr. Rattlesnake. Plan to share another angle on my wild wildlife experiences. Could include Gila Monsters, Tarantulas (yes, I pick them up! ), Desert Tortoises, Bobcats, Javelina's (no, don't pick those up), Giant Desert Centipedes, and who knows what else might appear in my blog.